Winter 2019/2020 – departures November 22, 29; December 6; 13. Prices include return Eurostar and rail from London St. Pancras to Wernigerode via Brussels, Cologne and Hannover, and are based upon 2 people sharing twin/double rooms. Hotel Altora, 3-star hotel ideal for train enthusiasts, overlooks the station and depot, and lies within walking distance of the market; £399 (single room supplement £110); supplement for 1st Class Eurostar and rail travel, £129. All prices based upon an exchange rate of €1.15 = £1, and are subject to confirmation at time of booking, as are exact train times. 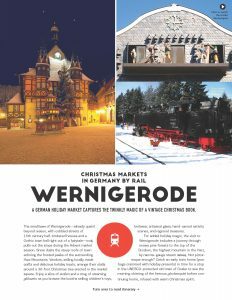 The small town of Wernigerode—already quaint beyond reason, with cobbled streets of 15th century half-timbered houses and a Gothic town hall right out of a fairytale—truly pulls out the stops during the Advent market season. Snow dusts the steep roofs of town echoing the frosted peaks of the surrounding Harz Mountains. Vendors, selling locally made crafts and delicious holiday treats, arrange their stalls around a 30-foot Christmas tree erected in the market square. Enjoy a slice of stollen and a mug of steaming glühwein as you browse the booths selling children’s toys, knitwear, artisanal glass, hand-carved nativity scenes, and regional treasures. For added holiday magic, the visit to Wernigerode includes a journey through snowy pine forests to the top of the Brocken, the highest mountain in the Harz, by narrow-gauge steam railway. Not picturesque enough? 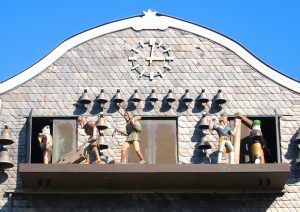 Catch an early train home (your bags crammed with holiday presents) in time for a stop in the UNESCO-protected old town of Goslar to see the morning chiming of the famous glockenspiel before continuing home, infused with warm Christmas spirit. Click on this link for a live webcam view of Wernigerode Market Square. Weisser Hirsch ****, or the Altora ***, where you’ll stay 4 nights, breakfast included. 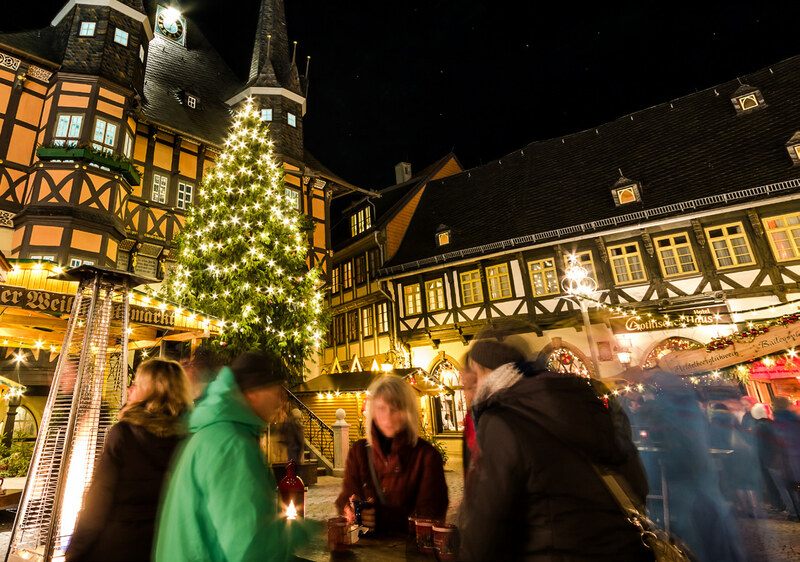 Day 2 – Saturday Visit the Christmas Market in Wernigerode’s market square. 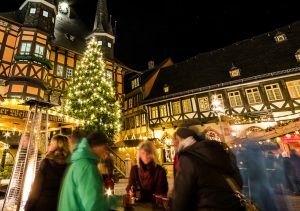 Day 4 – Monday Swing through the Christmas Market again and maybe visit Wernigerode Castle, a 19th Century Schloss with medieval foundations. 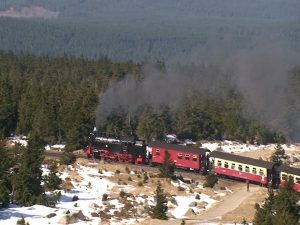 Day 5 – Tuesday Your train departs Wernigerode at 07:20 to arrive in Goslar in good time for the 09:00 Glockenspiel (Click on the image below left, for a video clip). Then on to Brussels for the Eurostar service to London St. Pancras, arriving 19:57. Later departure times are available on both legs of the journey (on the return, those opting for the later departure would miss the 09:00 Glockenspiel chimes in Goslar). From London St. Pancras, a 10:58 departure gets you to Wernigerode at 21:41; from Wernigerode, a 10:20 departure gets you back to London St. Pancras at 19:57. Discount fares are available to/from London St. Pancras from most major UK rail stations, in conjunction with this tour – prices on request.